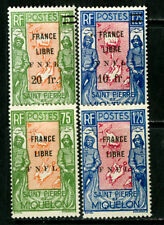 QV SELECTION HINGED ON PAGES.Mixed condition. 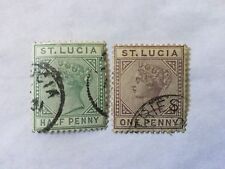 St Lucia: REVENUE1882 1d & 4d Barefoot 1 & 4 used with manuscript cancellations; good condition.Cat. £15 (Barefoot 2019). A very decent quality used 1882 fourpenny yellow. THEY ARE LISTED IN THE GIBBONS CATALOG AS #F13-#F19. THEY ARE LISTED IN THE GIBBONS CATALOG AS #F20, F24 & F27-F28. SG F13 to F17. 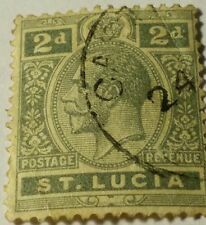 ST LUCIA Queen Victoria 1882. Very Fine Used Catalogue Value £131 . Add to Favourites. MINT & USED SELECTION HINGED ON PAGES.Mixed condition. THEY ARE LISTED IN THE GIBBONS CATALOG AS #F1 & #F4. SG F18 to F20. ST LUCIA Queen Victoria 1882. Very Fine Used Catalogue Value £215 . Add to Favourites. 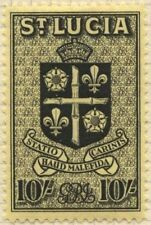 ST LUCIA 1946 VICTORY PAIR SG 142-143 MNH. 1946 VICTORY PAIR. SG 142-143. These are unchecked & unpicked with variance of colour & perf types etc. REST OF WORLD. INTEREST-FREE CREDIT OPTIONS UK Personal Cheque. ALL MINT NEVER HINGED WITH ORIGINAL GUM. Up to £15.00 Over £15.00. SEE SCAN FOR ITEM. excludes sending to P.O. Boxes: £10.00. No Hidden Faults, See Scan For Perforations. British Sterling Cheques. 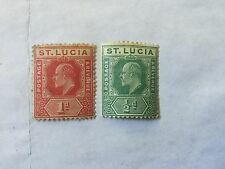 ST. LUCIA SG105, 5s green & red/pale yellow, NH MINT. Cat £60. 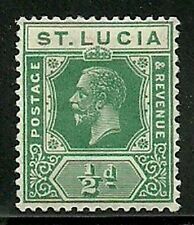 Saint Lucia x 5 QV stamps. Mixed condition, Unused no gum, MM, Used. Cat est around £400. If no "Add to Basket" button is visible. 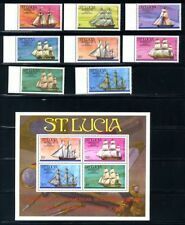 ST. LUCIA SG1144-145, COMPLETE SET, NH MINT. Cat £17. RSW. ST LUCIA 1953 CORONATION SG,171 UN-MOUNTED MINT NEVER HINGED NICE AND CLEAN CONDITION. 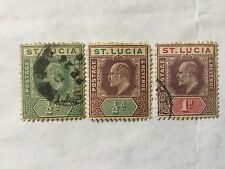 ST. LUCIA SG144-145, COMPLETE SET, NH MINT. Cat £17. RSW. Halfpenny SG 43 MINT Hinged with a few pulled perfs and One Penny SG 44 with small thin bottom right corner as scanned. SG 43 to SG 49. Add to Favourites. Catalogue Value £35 if perfect. Very Fine Used & MINT Lightly Hinged.